The token of choice given from Politarchopolis during the tenure of Their Excellencies Aonghus and Ginevra to visiting Royalty, Barons and Baronesses is a personalised handkerchief. This token fits in with the 16th century Italian (Her Excellency) and 16th century Landsknecht (His Excellency) styles of Their Excellencies. For the Royal visit by Their Royal Majesties Niall and Liadan, Mistress Mathilde Adycote of Mynheniot and I made the handkerchiefs. An interesting article by Magaret Roe (Roe, accessed August 2013) provides a brief history of handkerchiefs. It includes several images of 16th century Italian and Elizabethan handkerchiefs, and describes how the handkerchief rose to prominence in this time (particularly in Italy). Furthermore, an article by Genevieve de Valois (de Valois, accessed 2013) further emphasises the importance and prominence of handkerchiefs in the 16th century. This article describes how handkerchiefs were decorated with various kinds of lace, drawn thread work and embroidery (including coloured thread embroidery), and also gives examples of how they were given as gifts to Queen Elizabeth I.
Victoria and Albert Museum (accessed 2013). 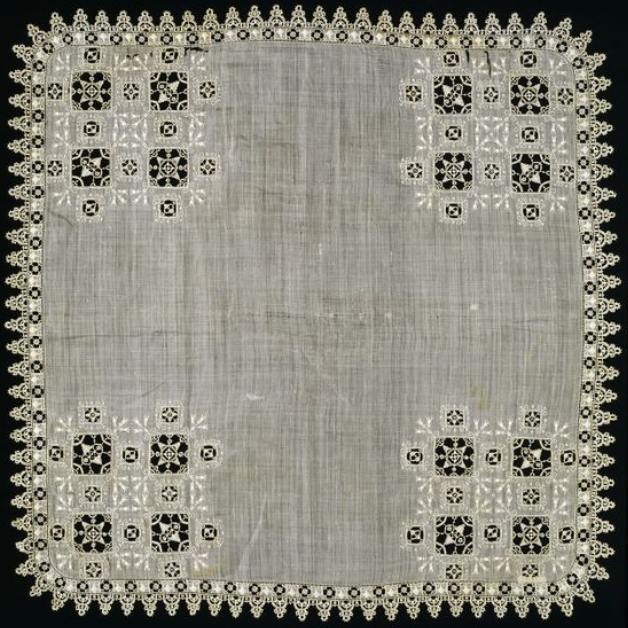 Italian handkerchief, c1600, ‘linen with cutwork, needle lace and embroidery’, museum number 288-1906. Stem stitch was used for the embroidery because there are extant embroidered objects that include stem stitch as an outline in both the 12th and 16th centuries. In the 12th century, for example, this stitch was used in vestments and seal bags including Opus Anglicanum techniques (Stockton, accessed 2013) In the 16th century, for example, stem stitch was used in blackwork techniques (Historical Needlework Resources, accessed 2013). This further links the period of Their Excellencies with that of the recipients of their handkerchief gifts. 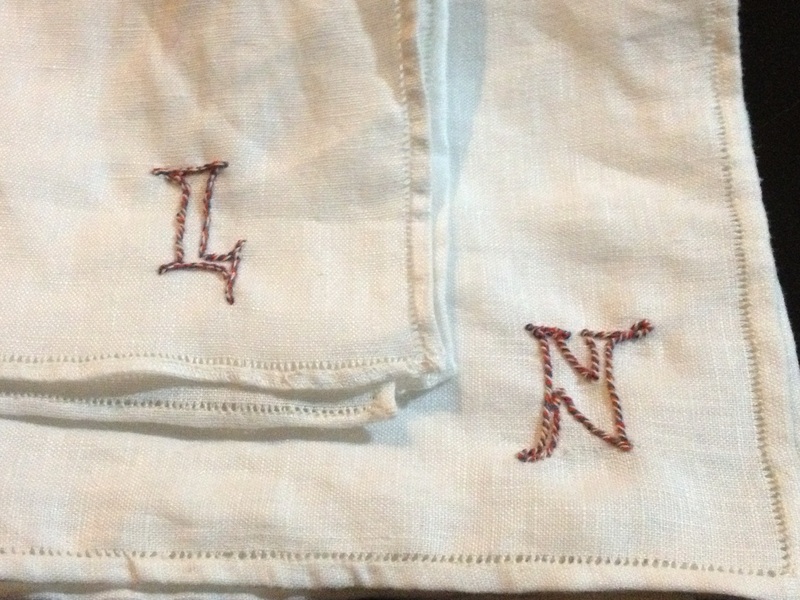 Mistress Mathilde hemmed two squares of linen using a decorative hem stitch. 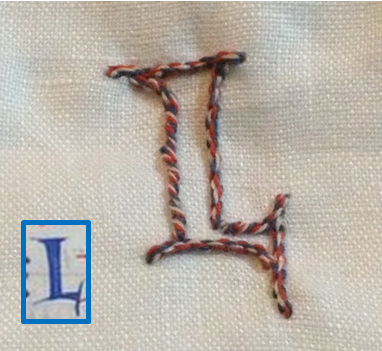 I added a stem-stitch monogram to each using a tri-coloured linen thread (in Lochac colours; red, blue and white) that I had in my stash. Each letter took approximately an hour from design transference to finish. To personalise them further, the style of the monogram was taken from the font of the 12th century bible of Hugh of le Puiset (BBC, 2013; Rollason et al, 1994). This time and place fits in roughly with the 12th century Crusader theme of the reign of Their Majesties. 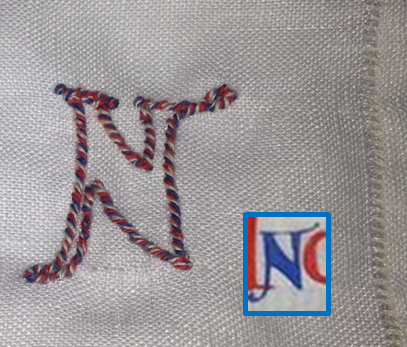 The N embroidered in stem stitch by Ceara, with the Bible of Puiset letter font it was based on to the right in the small box. The L embroidered in stem stitch by Ceara, with the Bible of Puiset letter font it was based on to the left in the small box. BBC, 28 June 2013 (accessed August 2013). In pictures: What is an illuminated manuscript? Image of Hugh de Puiset’s bible, 12th century, Anglo-Norman, England. Historical Needlework Resources, accessed August 2013. Blackwork. Rollason, D., Harvey, M. and Prestwich, M. (1994). Anglo-Norman Durham: The Bible of Hugh le Puiset (Durham Dean and Chapter Library, MS A.II.1). Page 471-484. Stockton, J., accessed August 2013. Five Period Embroidery Stitches. How did I never see this? So pretty!